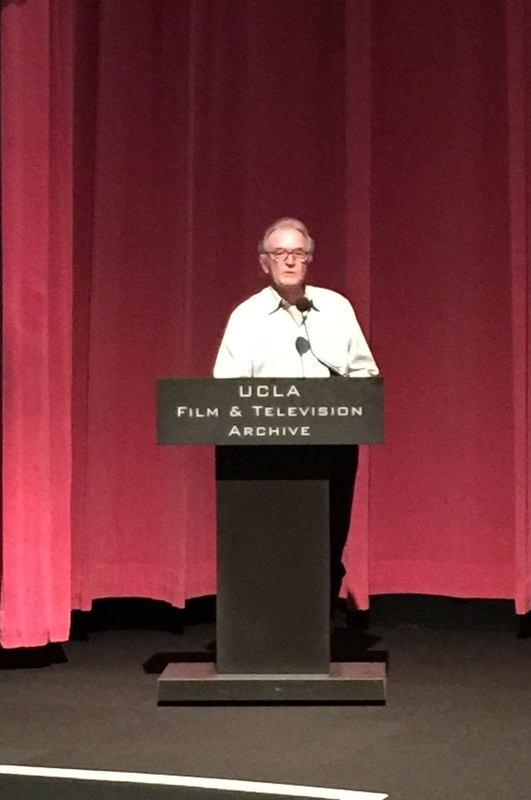 Tonight I attended BEAU GESTE (1939), another excellent screening in UCLA's ongoing series celebrating the films of director William A. Wellman. 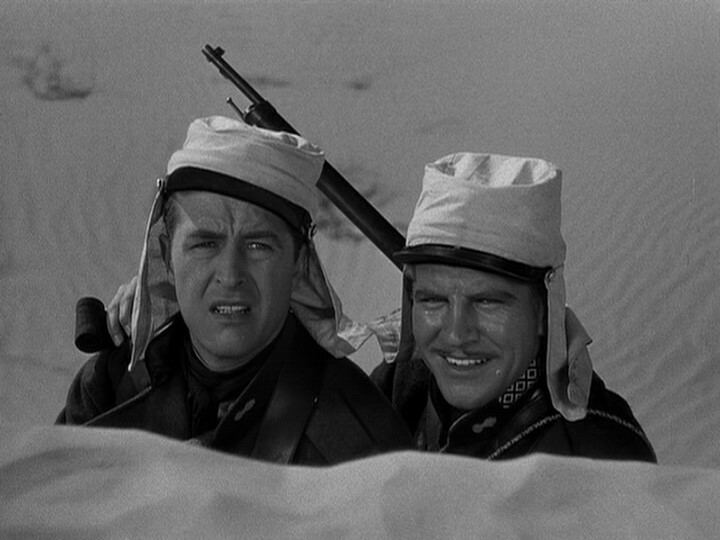 BEAU GESTE was introduced by William Wellman Jr. (seen below at right) and film historian Frank Thompson. Thompson shared information on previously proposed casts which never came to be -- Clark Gable and Robert Montgomery would have been interesting -- along with additional background on the movie's locations and other aspects of production. 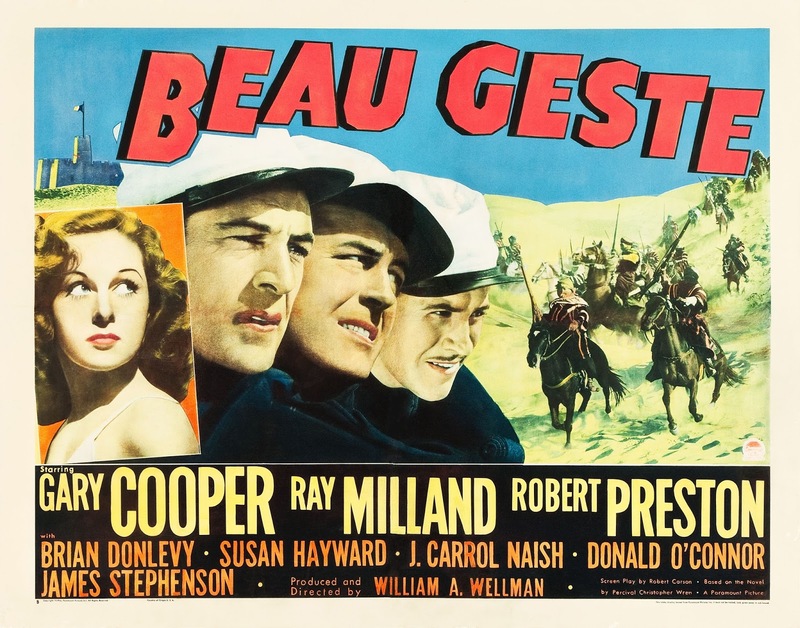 This was my first time to see BEAU GESTE, and while it was a more brutal film than I tend to like, I enjoyed it a great deal thanks to a terrific cast in a compellingly presented story. This is, quite simply, grand Hollywood movie-making. The setup of the mystery in the opening minutes of the film is unforgettable, as soldiers arrive at a desert military outpost which they discover is filled with dead men who are propped into fighting positions around the walls. The bugler (Robert Preston) is sent over the wall to investigate and open the gate -- and disappears! This entire sequence is absolutely chilling and certainly a slam-bang way to begin an adventure film. 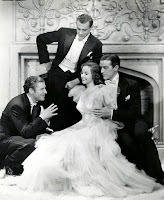 Then we go back in time to become acquainted with three orphans, Beau (Gary Cooper), Digby (Preston), and John (Ray Milland), who are being raised by Lady Patricia (Heather Thatcher). 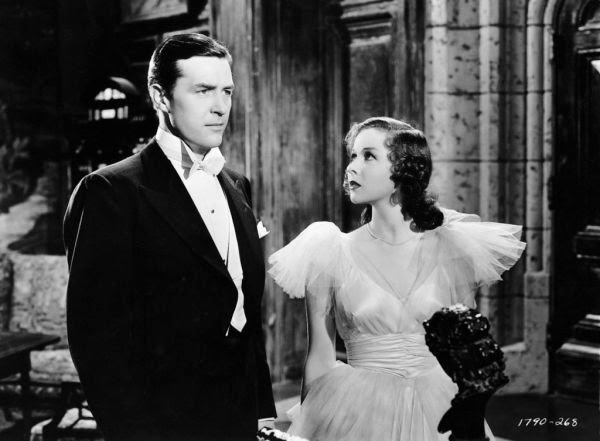 John is in love with another of "Aunt Pat's" wards, Isobel (Susan Hayward). Lady Patricia's funds are dwindling, and when her absentee husband is expected to arrive home and sell one of her last remaining assets, a giant sapphire, the sapphire suddenly disappears. 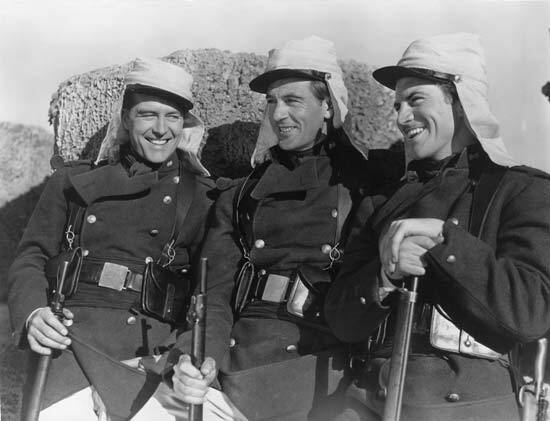 The three brothers each claim to have taken it and go off and join the French Foreign Legion. Beau and John serve under sadistic Sergeant Markoff (Oscar-nominated Brian Donlevy), and while they hate him, they help to quell a mutiny. Just as that incident is coming to a head the fortress is attacked and the men must all join together to fight a common enemy. The movie ultimately circles back to the opening scene, followed by an explanation of what happened at the fort, along with a resolution to the story of the missing sapphire. The film has a charismatic cast comprised of three future Oscar winners and two future Oscar nominees, including Donlevy's nod for his role in this film. While the lovely young Hayward's role is mostly decorative, each of the men in the cast has moments to shine. The brothers' devotion to one another is extremely moving, while Donlevy's Markoff is a truly memorable movie villain. Among the supporting cast, Broderick Crawford is a standout as an American cowboy who joins the Legion. The cast also includes Albert Dekker, Charles Barton, James Stephenson, Harold Huber, G.P. Huntley, Harry Woods, Henry Brandon, Nestor Paiva, and George Chandler. Donald O'Connor, Martin Spellman, Billy Cook, and Ann Gillis play Cooper, Preston, Milland, and Hayward as children. The movie was filmed in black and white by Theodore Sparkuhl and Archie Stout. The exteriors were filmed at the Paramount Ranch and in sand dunes in Imperial County, California. The film runs 112 minutes. Robert Carson's screenplay was based on the book by Percival Christopher Wren. BEAU GESTE is a Paramount film which is available on DVD as a single-title release or as part of the five-film Gary Cooper Collection. As a side note, it's been lovely seeing so many members of the Wellman family turn out to see these movies! I hope to return for one more screening in this series, TRACK OF THE CAT (1954), where William Wellman Jr. will be joined by Robert Mitchum's daughter Petrine to sign books before the film. Truly one of the movies that come to mind when I hear the word "classic". Really good Wellman movie (and not the only version of Beau Geste but it's not in the least stale). I've enjoyed it more than a few times. If I'd known you were going, I would have encouraged you to stay for The Light That Failed, which I like even more. But perhaps you've seen it already and don't like it as well--it's a pretty downbeat movie, though beautifully done. I've been wanting to see this one for a while, and I'm even more interested now that I see it was directed by Wellman. I've been very impressed by several of his movies over the last couple years (The Ox-Bow Incident, Island in the Sky and Goodbye, My Lady) and I'd like to see more. This was such a good one, Caftan Woman! Blake, thanks much for that feedback on the evening's second film. I'm interested in seeing THE LIGHT THAT FAILED due to the cast (especially Lupino), but I knew it was on the "heavy" side and with BEAU GESTE running close to two hours and a busy day today, decided it would be better to have an early night. I'll try to catch it in the future! Will probably do the same thing next Sunday night, I plan to see TRACK OF THE CAT (have never seen it before) but not stay for THE OX-BOW INCIDENT. Elisabeth, I suspect you would like BEAU GESTE, it's a rich story and has a sort of "good book" feel to it. If you catch it do let me know! Hi Laura, I'm glad you liked it! Such a classic, and the book is too. Despite being a Kipling fan, I haven't seen "The Light That Failed" yet either, thank you Blake as well, I must try to see it soon. Hi Mary! If you catch THE LIGHT THAT FAILED I'd love to know your thoughts on it. 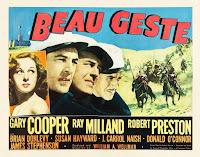 BEAU GESTE is one of those especially good films which "stays with you" after you've seen it. Over the course of the week it's given me much to reflect back on. A great experience.